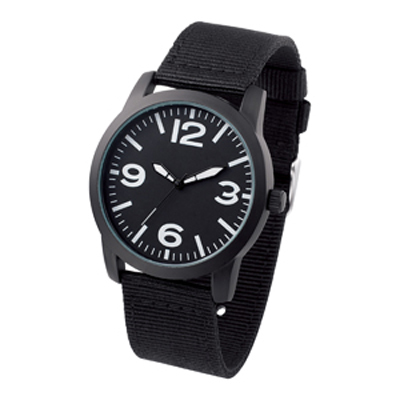 Features: Stylish analogue sports watch with black alloy case, black nylon strap, high accuracy quartz movement and luminous index and hands. Waterproof. Includes 1 x Button Cell Battery.. Certification: CE, RoHS. Product Colour: Black. Product Size: 42 mm (dia) Case. Print Area: 16 x 6 mm. Print Process: Pad print, Mirror logo. Delivery: 4-5 weeks (indent) from art approval. Standard Packaging: Bubble bag. Packing Details: 100 pcs per carton, 6.5 Kgs, 31x28x24 cms. Setups: Included.